Research under the CGIAR Research Program on Forests, Trees and Agroforestry (FTA) aims to tackle the challenges of making tropical forest management more responsible and sustainable. In a short project presentation, CIFOR scientists lay out the benefits of their research to come to an integrated landscape approach in implementing REDD+ and other land-use strategies. “An integrated, landscape-level approach is urgently needed to assess the carbon trade-offs and spill-over effects of various – often competing – land-use decisions,” they write. Good governance is needed, as well as equitable benefit distribution. And last but not least the success of strategies to reduce emissions, improve livelihoods and conserve biodiversity have to be assessed properly. 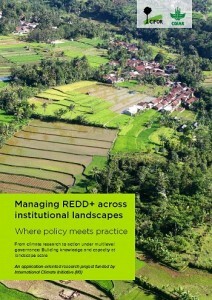 Therefore, scientists aim to “provide REDD+ policy makers and practitioners at all levels of governance with the best available knowledge about what works – and what doesn’t – in REDD+ projects”.